Post summary: Highlight eventual memory issue when using Telerik Testing Framework and TestStack White for desktop automation. Memory is an important aspect. When you have several test cases it is not a problem. But on large projects with many tests memory turn out to be a serious issue. 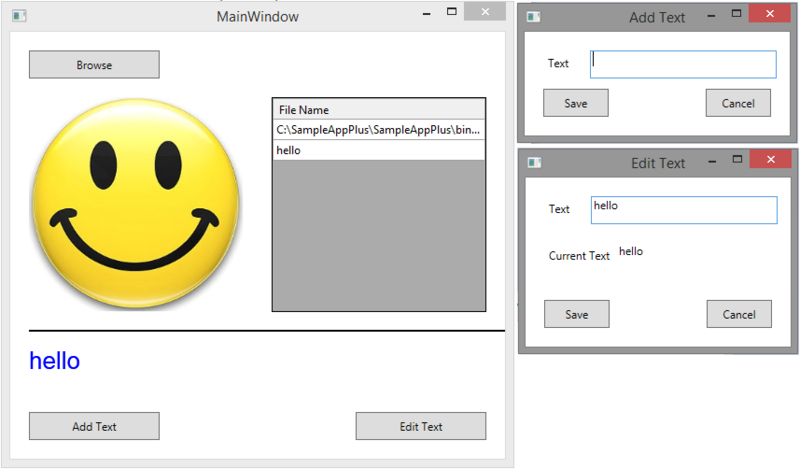 Like every demo on certain technology automating WPF applications looks cool. And also like every technology problems occur when you start to use it on a large scale. Problem with WFP automation with Telerik Testing Framework and TestStack White is the memory. When your tests’ number grows frameworks start to use too much memory. By too much, I mean over 1GB which might not seem a lot but for a single process actually is. Increasing RAM of test machine is an only temporary solution and is not one that can be scaled. I have a project with 580 tests and 7300 verification points spread in 50 test classes. I’ve spent lots of hours debugging and profiling with several .NET profiling tools. In the end, all profilers show that a large amount of memory used is in unmanaged objects. So generally there is nothing you can do. It seems like some of the frameworks or both have memory issues and do not free all memory they use. The solution is pretty simple to suggest but harder to implement – run each test class in the separate process. I’m using a much more enhanced version of NTestsRunner. It is running each test class in separate windows process. Once the test is finished results are serialized in results directory, the process is exited and all memory and object used for this test are released. The memory could be a crucial factor in an automation project. Be prepared to have a solution for it. At this point, I’m not planning to put running tests in a separate process in NTestsRunner. If there is demand it is a pretty easy task to do it. Post summary: How to sell your automation to management. Guide for running the tests unattended. As you have noticed when running the examples it is not possible to do anything else while tests are running because both Telerik Testing Framework and TestStack White are using mouse and keyboard in order to click and type text. This is how both frameworks are designed and work. It doesn’t seem very effective if you are wasting your time watching tests running on your workstation instead of doing something productive. This is not a good argument when advocating your automation. This topic is not about Automation vs. Manual testing so I will not go in that direction. I’ll just say that still there are companies lacking management willpower to support and embrace automation. So we need to be good salesmen! Free to use and pretty easy to work with frameworks. Some enthusiasm to make the first automation. Remember, be smart and first automate most repeating scenarios. This will show real results and help you buy some time for further automation. You get the machine, set up the framework, set up scheduled tasks for deploying the latest application under test and latest test code. Run the tests and get into trouble. Tests do not run! This is because there are special requirements to schedule unattended run. There must be an active Windows session in order mouse and keyboard to be used. Once the session is interrupted tests stop. This is detailed KB article on the topic with several possible solutions. You can try solutions in the article to see which works best for you. For me, the solution is to have a remote desktop in remote desktop. This requires Windows Server installation. The only server provides two simultaneous remote desktop sessions. There are unofficial patches for non-server versions which I haven’t tried and cannot comment. Two local users are needed on the Windows Server with no desktop locking or screen saver (domain users most likely will have desktop locked after a time). Log from your machine to test machine with the first user. From first user’s session log to same testing machine with the second user. Tests are started from second user’s session. Once tests are started you can freely close desktop (not log out!). You can create a scheduled task which runs only when the user is logged in and just wait for results in the morning. If two accounts are overhead there is an option to use software that prevents your computer to lock. See prevent screen lock thread if something works for you. Automation is an exciting field of career development for test engineers. This blog is dedicated to automation testing. You will find very useful and interesting topics in it. I would definitely encourage you just to give it a try. Good luck! Post summary: Use already created Page Objects and build up test framework. Below is App.cs which is a representation of application under test. The constructor takes an instance of Telerik Testing Framework’s application (WpfApplication) and TestStack White’s application (Application). Those are stored in the App instance. 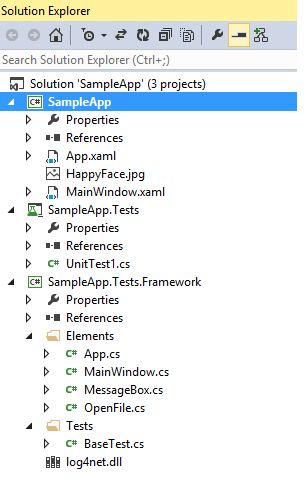 Each window in a real application is represented by a property in the App class. When accessed a new object of this page object class is created and its elements can be accessed. From the located window we need only the VisualFind which is used internally to locate elements on that particular window. In the example above every time, an action is required a new page object is instantiated. In some cases instantiating the object may require longer time or you might need some properties in this object preserved during tests. In such cases, you may use Singleton design pattern and instantiate only one object. Both approaches have pros and cons. In case of new page object, you always work with a fresh instance without any previous state saved. This might require more time to instantiate the objects and you are not able to save previous states. Cached objects may be much faster as a performance but having internal state may lead to unexpected bugs in your automation. Finally to make all work we need an instance of App. The instance is created in BaseTest.cs class. All tests inherit from the base test class. Initialise and clean up code is added in the base test. In our case Start() method is the initializer. It must be called in order to instantiate App class. App property is protected so every extending class has access to it. The process is obtained out of White Application.Process property. Opposite launch order is not working. White is not able to Attach to running process. 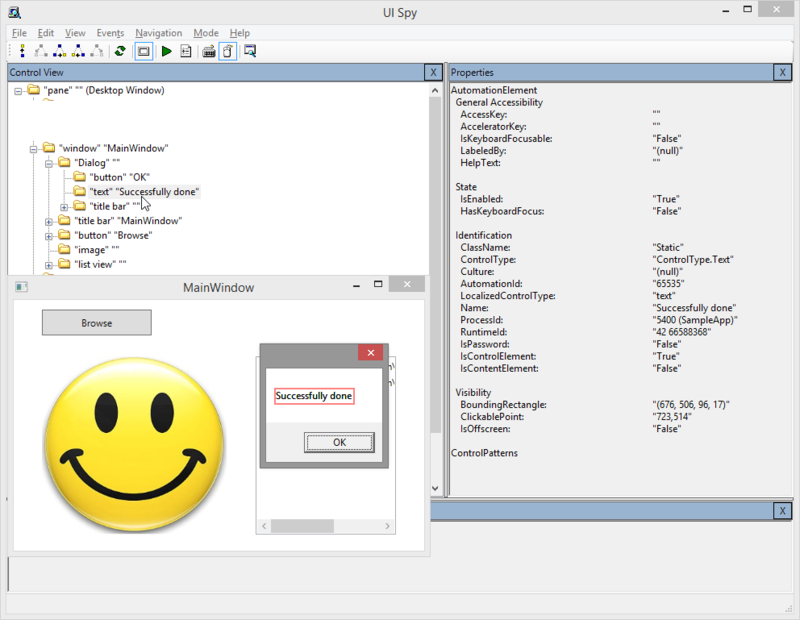 This will find and create a new instance of MainWindow and then it will find and click Browse button. Your framework defines the actions on elements which are later used in actual tests. Once all the work on framework has been done it is that simple to build your tests. Stop() method is called at the end of the test in order to close the application under test by killing the underlying process. This is unit test created with MS Unit Testing Framework in order to demonstrate real testing on the application. Unit testing frameworks are designed to run tests in random order. Before each test method annotated with [TestInitialize] is run. In our case application is started. After each test method annotated with [TestCleanup] is run. In our case application is stopped. For this simple application running tests with a unit testing framework is OK. We are not doing unit tests but functional once. So for bigger and more complex tests unit testing frameworks are not very convenient. I’ve created very simple tests runner. This post describing the need of such tests runner. This post shows how to build up the framework based on page objects. 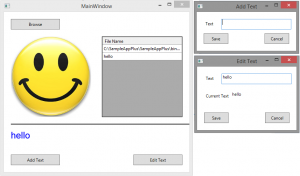 Next post is WPF automation – running the tests.